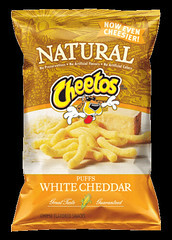 In the cheese snack war between curls vs. puffs, I tend to side with the puffy kind. Maybe because of its texture. Maybe because of the amount of cheese in every bite. Maybe because I’m puffy myself. I really can’t say for sure but ever since I was a kid, I preferred Planters Cheese Balls over Cheese Curls. 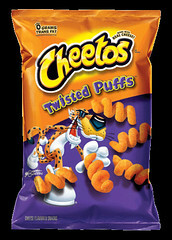 That’s why when it comes to Cheetos, I really like Twisted Puffs. That is, until Cheetos Crunchy Cheddar Jalapeño came along. This is the devil’s work, I tell you. Cheesy. Spicy. What more could you ask for?!? Well, maybe a Cheetos Cheddar Jalapeño Twisted Puffs hybrid. But I’m not greedy so I’ll happily settle for this. 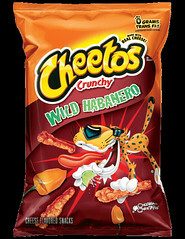 …and the Cheetos Crunchy Wild Habanero. I really hope S&R gets them in soon. 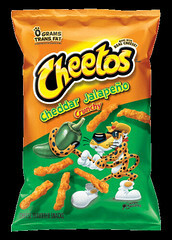 Author ManEatManilaPosted on February 12, 2011 Categories Junk FoodTags cheetos, junk food6 Comments on Ch-ch-ch-cheetos!